A £500m scheme to redevelop a city shopping centre has been granted planning permission. On Wednesday, Bristol City Council announced the scheme to rebuild the shopping area would go ahead. The application won unanimous approval from the planning committee. The scheme will create 108 new shops and homes and could bring 2,000 new jobs to the city, says the council. Council leader Barbara Janke said: "This is extremely good news and a real step forward for the city." 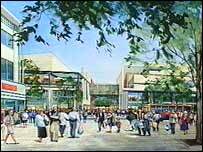 Land for a £500m plan to revamp Bristol's Broadmead shopping centre looks certain to be made available. The city council has issued compulsory purchase orders to help secure all the land needed for the development. The central Broadmead area should be transformed by the scheme, with a new layout and more than 100 new shops. Statutory notices will now be sent to all owners and tenants of properties within the 15 hectare development area. It is hoped the revamped centre will be opened in 2007.